Blue Skies and Shoofly Pies: I Wrote That? A few times a year I contribute to other writing projects, and it always surprises me when something I wrote arrives in the mail in published form. Sometimes, a tiny check even arrives, and that surprises me more. Writing is a great way to make dozens of dollars, as any writer will tell you. 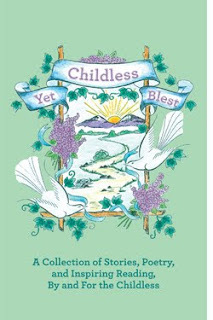 About 3 years ago, I heard that a book was being assembled on the topic of being childless. 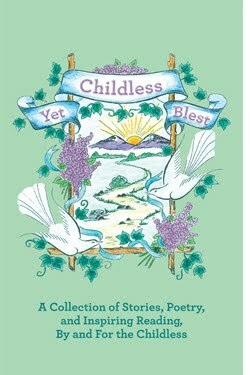 The editors were looking for contributions from conservative Anabaptists in order to put together a book that might encourage other childless couples. This was a topic I really felt I could type my fingers off about. It would be easy for me to make a thoughtful contribution on what it is like not to have any children. Particularly, what it is like to be ensconced in a culture that values family (which is a good thing) sometimes to the point of exclusion (which is bad). Sure enough, I fired off a solid essay and sent it to the editors, a childless Amish couple. Years went by, and I assumed the book project was dead. It had simply disappeared off the radar, I heard no more mention of it. Maybe they couldn’t find enough contributors among plain people (not that I consider myself “plain”) who did not have children, was one guess. Perhaps not enough interest, and so not worth the time. Less than two weeks after we arrived home with Duckling, my husband handed me a fat package with an unfamiliar return address. Wouldn’t you know, it was the finished book? So, the project hadn’t died after all. Here it was, a thick book full of experiences written by couples who counted themselves as a complete family, without children. Each essay was a mini-memoirs of hope, pain, decisions, and sometimes feelings of contentment. The timing was uncanny, since we opened the package while holding our newborn, our first born. But what really surprised me was what I wrote. I won’t share that essay here, since it is protected by copyright and was written as a contribution to that book and nothing else. As I began re-reading my essay with fresh eyes, I could only think, “I wrote that? I thought that?” It wasn’t that my essay no longer applied, or that my feelings had changed. Everything I wrote was true, I just remembered my feelings differently. Time had changed the filter on the lens through which I viewed how I would have expressed those feelings. I would have written it differently even a year ago. This, to me, is one of the great mysteries of writing, or creating anything for that matter. So little of what you create today will appear exactly the same to you with the passage of time. You’ll remember it as being another way, or new experiences will shift the light and your perceptions. It was interesting to see first hand how just a few years could make such a difference in how I would have written about a single area of my life. I wouldn’t change those first four years of my marriage for anything. That time spent with just the Mister and I, and our handful of dogs, are forever precious to me. Just as God had given me a long season of singleness before meeting the Mister, God gave then us the gift of time together and the freedom to pursue some things we otherwise would have been too busy to take on. His time may not have matched the expectations around us from other people who anticipated we would quickly start a family, but His time is always the right time. The superiority of God’s exact timing is a truth that, if I am to be honest, I sometimes have trouble believing. And yet, you have no choice. Nothing can happen a second before the timing is right, no matter what you do. Sometimes I think life is one long lesson on patience. If interested, the book, Childless, Yet Blest can be ordered here. While written largely by and for the horse and buggy crowd, any Christian who either longs for a family or who has chosen to bloom where they are planted without children will be able to identify with the thoughts and feelings described in much of the book. As an aside note, the book also gives an interesting glimpse into the world of childless families in plain culture. While images of Amish children have become so commercialized and ubiquitous, it’s easy to forget that some people have unique life paths that don’t always include the typical large plain family. Congratulations on getting your story published. And what a wonderful surprise for you! This is so funny, as my "Mister" and I just had a conversation today about God's timing ~ and also how we spend so much time thinking about and planning what we think we want and He'll pop something out of the blue that we didn't even realize we wanted! I hope you're able to finish the construction on your house with those dozens of dollars you've made to-date. LOL! You're too funny. Isn't it interesting that the timing of your learning that your essay had been published coincided just at a time it could make the most impact again in your life? I fully agree with what you say about looking back at our writings that show who we used to be. I have a big box of my own handwritten letters to my parents from the time I had my first baby through her first four years. I just can't believe that was me. Congratulations on being published! How fun! I've been thinking a lot recently about how I will look at something I've written in future years. Thanks for your thoughts on the topic. Sometimes I feel a desperation to write things down for my daughters, now, while I'm in the heat of the little years, lest I forget. I'm so glad you are back to blogging. Congratulations, friend! I hear you loud and clear on the whole timing thing. I've flat flunked out of The Very, Very Good Waiters Class. Our pastor preached a wonderful sermon recently and mentioned that often, God's answer/way of bringing us out of an extended season of testing is very surprising. Anyway, I enjoy your writing, as do many other people. Kiss the Duckling's head for me, won't you? So glad to see you again dear one. I have missed your posts.